The featured speaker at our Jan. 11 meeting is Kathy Moine of Green Thumb Nursery in Lake Forest, who will make a presentation on “New Rose Varieties.” She will speak to us about the array of new roses this year. And, she will address how to plant and care for new and existing roses, including use of fertilizers, fungicides and pesticides. Ms. Moine’s passion is all things gardening, and she loves teaching others. 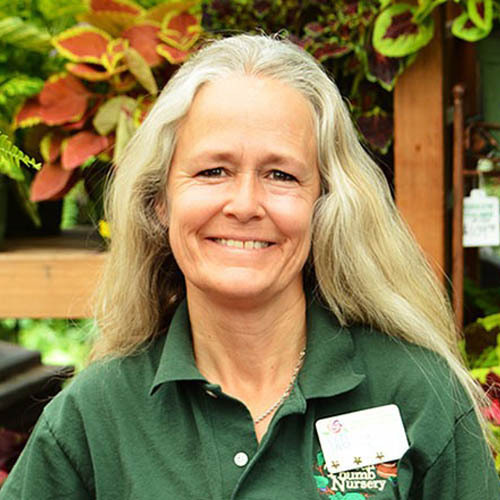 She has been with Green Thumb Nursery for 24 years and has been an Advanced California Certified Nursery Woman for 23 of those years. Each of our meetings features a popular speaker, refreshments, plant sale, and an opportunity to meet and greet members and hear club business. Go to Featured Speakers Every Month for our annual line-up. Members and those interested in joining the club are welcome to attend our meetings on the fourth Friday of the month from September – May in Tankersley Hall, Laguna Presbyterian Church, 9:30 am – noon. The entrance to the hall is on Second Street between Forest Avenue and Mermaid Street. If you have any questions, please contact us. Hope to see you!